So you’re planning to remodel or renovate your kitchen. If your remodel includes replacing your countertops, you may not know right where to start. With that in mind, here is a collection of the most commonly asked questions. Ask yourself and your fabricator, these questions as you chat about your design. Along the way, we will give you questions to ask, and a corresponding blog to give you more detail. How Thick Does A Countertop Need To Be? A typical countertop is between two to three centimeters thick. This is typically determined on by your desired style and price. 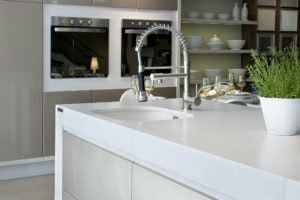 Typically thicker countertops are generally more durable. Also, consider thinking about changing up your countertop edge. This is mostly based upon your design preference. Finishes include honed (matte), polished (shine), leathered, and antiqued (textured) Tell your fabricator or designer what you want from a countertop they can help you choose the finish best for your lifestyle. With natural stone countertops, such as granite, marble, or quartzite you will have more maintenance. Quartz and other man-made materials will require less maintenance such as sealing and cleaning with certain cleaners. This is where you should chat with your fabricator or a designer on which material to choose. Your material choice will depend on things such as, the time you have to maintain it, if you are cooking or baking often, your home’s style, if you have children, etc. 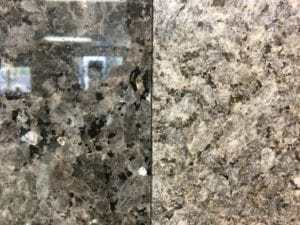 More Detail: Showroom Showdown: Granite vs. Quartz, and The Difference Between Quartzite and Quartz. If you are planning a renovation or remodel and have questions feel free to contact us.